What drives Testtraxx is simple...it is my desire and promise, to provide you with the simplest, most functional, well built and fail safe engine test track available. Buy once, use it day in and day out for a lifetime without ever thinking about it...period. Testtraxx is handcrafted in the USA for modelers and hobbyists worldwide. What are the quality materials which go into each Testtraxx? 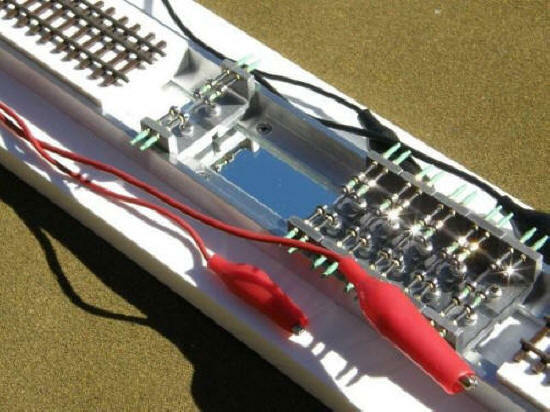 The durable and characteristic white base of each Testtraxx is made from "Marine Starboard". It is a dense, heavy duty plastic base used in the marine industries, impermeable to moisture, lubricants and virtually anything you can put on it. It is very difficult to mar or deform the surface. It remains a uniform size and shape through intense conditions and usage making it an ideal base for this product. Marine grade extruded aluminum angle is cut, machined to plus or minus 0.002" or 0.06mm, then tumbled to create a professional, warm looking, uniform surface. All hardware is Stainless Steel except for low profile nuts which are brass on the carriages. Brass nuts are softer than Stainless, bind to the screws easier under torque and are thus more suited to this usage. All bearings are Stainless and shielded on both sides except for the Style 1.2 carriages which, because of their bearing size/width, 1.5 x 4.0 x 1.2mm, shielding is available on one side only . What makes this new version of Testraxx better and improved? Testraxx has been redesigned with creative, outside the box engineering and simplification...all with one goal in mind...to have the simplest, most functional, well built and fail safe engine test track on the market. To further this goal, all Testraxxs have now been reengineered around bearing size. This simplifies the amount of extraneous parts and shims required AND makes a much more consistent Testtraxx. Check out our new Dual gauge HO/HOn3, HO/HOn30/HOn2 1/2 and N/Nn3 Testtraxxs at 'What's New?'. 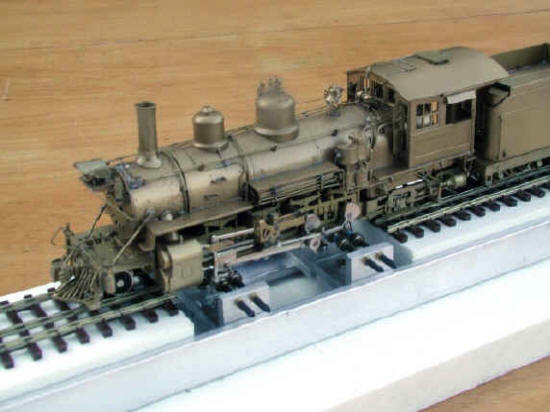 Their clean lines, simplicity of operation and functionality all come together to give you, the dual gauge enthusiast or technician, a truly useful tool to enhance your enjoyment of this hobby. Do you make an HO/HOn30 track stand? Yes, with Style 1.2 bearings...e-mail me for particulars if needed. Where can I use Testtraxx? You can use Testtraxx on your layout, at or around your layout, at your work station, your desk or anywhere else where track power is accessible. 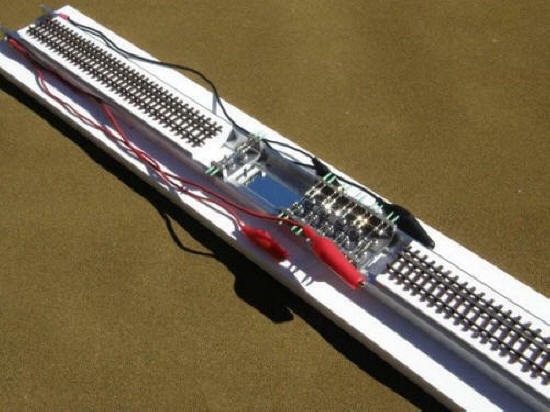 There are now two power leads on each side connected to each of the rails. 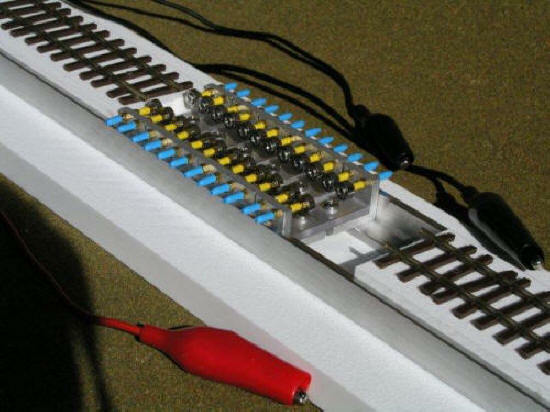 One alligator clip from each side allows you to simply, easily and effectively connect to power leads or connect to track rail for your power needs. The other two alligator clips each connect to one rail of the tender slider for locomotives requiring power pickup from the tender. 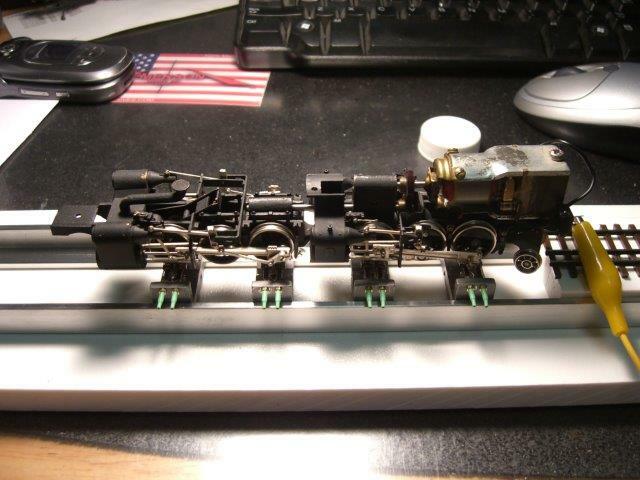 I have locomotives from a couple different scales that I would like to run. Do I need to buy a separate Testtraxx for each? Absolutely not! Testtraxx truly is adjustable... ALL scales, from O to N, use the same Testtraxx base. That means that after you have bought one Testtraxx complete, you only need to purchase the number of carriages you need for each scale...all carriages will fit the one base...can't get much simpler than that! Why have prices gone up???? Unfortunately...the prices were increased in 2007. The primary reasons for this was: your new Testtraxx was re-engineered to closer tolerances (+ or - 0.002"), the cars are now made from machined parts, they have a clean professionally tumbled, warm looking finish and the entire Testtraxx is individually handmade right here in the USA. Each step of this process is checked and rechecked for fit, accuracy and operation with micrometers. Each carriage is individually put together by hand...my hand...tested and adjusted to NMRA standards for each scale. If a part is meant to slide...it does...easily. Your new Testtraxx doesn't leave my workshop unless I am satisfied 100%, that you are getting the finest working engine test track I can make. The last reason prices were increased was that material costs tripled this last year...as they continue to do even now. There have not been any Testtraxx price increases since October 19th, 2008 though sadly on that day, prices were increased about 5~8% to reflect the current cost of materials, shipping, etc. I had continued "to eat" those increased costs for the previous year but, to survive, I had to pass some of those costs on to you, my customer. Since 2008, on the plus side...I have not passed on to you any of my cost increases, choosing instead to tighten my belt. Also, and most importantly, this allows me to continue providing you with the simplest, most functional, well built and fail safe engine test track available. Thank you for your business!!! I guarantee your new Testtraxx 100% period! If it does not do what I say it will do...contact me first. If it doesn't do what you think it should do, ask before you buy...if it is sitting in front of you...contact me first...by phone or e-mail. I guarantee the simplest, most functional, well built and fail safe engine test track available or your money back. 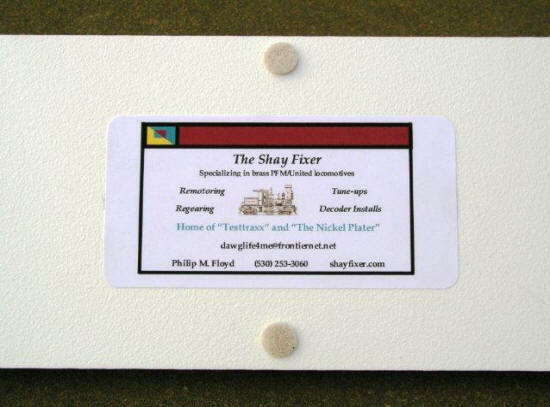 Shipment and insurance back to "The Shay Fixer" is paid by you the buyer and it must be received by me in as good as shape as I sent it out to you. That is the 'not so fine' print. Can you customize a Testtraxx for my own particular needs? Customizing is no problem...contact me by phone or e-mail before you buy so we can create for you the Testtraxx you desire and make it right the first time...pricing may change to reflect your needs. Can articulated engines easily run on your Testtraxx? It supports the use of articulated engines as easily and quickly as any other style of engine. Thank you for providing excellence in product, delivery and support service in my recent purchase of a Testtraxx. In less than the one week since I purchased Testtraxx, I have used it to mechanically tune (including adjustment, lubrication and wheel cleaning) of several locomotives. 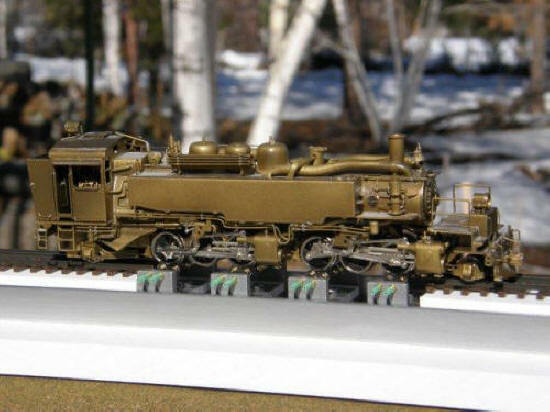 They included rod engines, a three truck Shay and Heisler with very little physical handling of these weathered locomotives. In addition, I have combined a laptop computer running Decoder Pro, my DCC system and Testtraxx to efficiently program my locomotive’s decoders right at the shop’s bench top. Very convenient! I had a chance to use the new Testtraxx over the weekend and it works great. I originally planned to use it to occasionally run my engines since I don't have a layout right now. However, it also works great to help tune a Tsunami sound decoder, easily adjusting sounds while the engine runs along. Your Testtraxx isn't cheap, but you get what you pay for, and it appears to be high quality with tight clearances! Keep up the good work. If you need a reference, feel free to use my name. I received my Testtraxx from you, "The Shay Fixer", a couple of months ago. I have found that it is an extremely useful tool to have around. I use it with my computer, JMRI ‘s Decoder Pro, and my SPROG II. This makes an unbeatable combination for setting up DCC equipped locomotives. This makes an unbeatable combination for setting up DCC equipped locomotives. For those interested and reading this, try one…you will not be dissatisfied. Hi, boy have I have been enjoying my new Testtraxx!. I have been showing it around to several individuals and local hobby shops in the area. ‘Just Trains’ in Concord was impressed and asked me to come back on 4/26/09 and demo the unit. I will be using the Testtraxx in combination with my SPROG II, Decoder Pro, and computer. Could you please send me 12 - 25 of your business cards so I can pass them out if anyone is interested in getting a Testtraxx? Thanks. …got it Thursday. I tried it out on my recently acquired ‘Mudhen’ with little success, engine made noise but didn't run, tried an 0-8-0, which worked fine... so there is no problem with the Testtraxx… seems your product is everything it should be! Thanks. I really like the plastic covered screw ends on the carriages as they make positioning so much easier. The Testtraxx arrived Thursday afternoon. It looks fantastic! I have not had a chance to try it yet. Testtraxx arrived on Thursday. It will get well used this weekend!! Arrived Saturday - been playing with it since - a jewel –THANKS! Testraxx arrived yesterday, beautiful! Many thanks. I received the test track on Friday in perfect condition. I intended to give you an operational report, but my HO power supplies are buried in storage at the moment. I thought I had left one out, but apparently I can't remember where. I'm very happy with the track. I'll let you know when I have a chance to actually "test" it. Received my Testtraxx today…must say I am very impressed with the quality and design. I can’t wait to try it out. It’s been a real pleasure to do business with you. Sorry about the late reply. I've change email accounts. It did arrive, without any problems that I know of. My husband is thrilled to have it! However, he hasn't used it yet; his transformer is hiding somewhere in the garage. I will have him let you know how he likes it when he does. Your test stand was received in good order today. Thanks. Your parcel arrived today. Thanks. Must have been a huge backlog in mail over the Xmas holidays. All is well. The tender looks fantastic as does the Testtraxx which, as yet, I have not operated. If it performs as good as it looks one will be very satisfied. Congratulations on a great looking product. I will keep in touch as to my successes. Happy New Year to you and your family.